I had a bunch of these pique tea packets left and they were so fun to work with, I decided to try another recipe! Last time I made this cocktail with them. I knew this tea would be great in a cupcake, all I had to decide what kind of frosting to create with it! I know what ginger is a fun flavor with green tea and I thought, ginger buttercream? Why not?! I'm not blogging to be boring, I want to be adventurous! All you have to do is mix the pique tea crystals with the milk in the recipe. I encourage you to use whatever amount you think is best but I honestly like to have a strong flavor so I used 4 packets in the 1 1/4 cup of milk! Do this step first before starting the recipe and place your tea infused milk into the fridge until it's time to add it to the batter. You don't need to heat your milk, but you can if you'd like! I tried a little experiment using mini cup cake papers but honestly I wouldn't do it again. Use full cupcake liners, you'll make less than is what is shown here but they will have a better shape. This tea has fragrance has such a wonderful and it's apparent in both the batter and when they're baked! You may have seen the "spicy frosting" heading at the start of this post. I won't lie to you, with 2 tablespoons, this frosting had a KICK. If you want the ginger flavor with less of the kick I would mix everything together and gradually add in ginger to your taste. 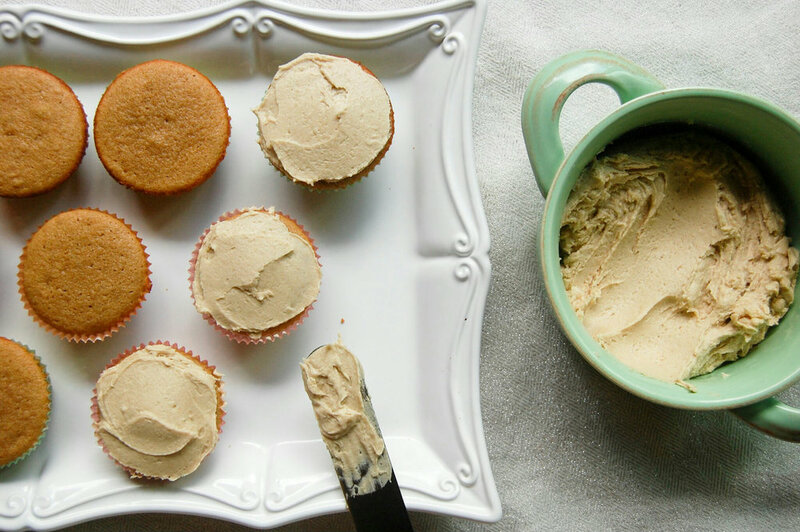 But let me tell you something about this spicy frosting...IT IS AMAZING. I thought it would be a bit strange but I really liked the spiciness contrasted by the sweet cupcake and the flavor of green tea! Yes, cupcakes were harmed ...I mean eaten...in this process! Another note about the actual cupcake. These are THICK. If you want them to be a little less thick you can add a tiny bit more milk, try a few additional teaspoons. I actually loved how thick they are because they are a perfect for pairing with tea! I wanted to add this note though because not everyone likes cupcakes to be this way. You can check out Pique Tea here and see all their teas! These last a while because there are a bunch of packets in one box and I think theyre great for on the go tea without sacrificing the flavor!